We all have that friend you want on a weekend away, the kind that will take care of every detail! Damian Cerini is that friend. Damian used to take a group for the weekend and treat them to tracks, food and wine tastings across this fair region. Needless to say, it was a hit and news travelled quickly. Today, Damian can proudly say he’s ran “Tour de Vines” (now an international business) for 15 years! Experience the spark that set this business alight – organise some friends and join this leisurely cycling tour. 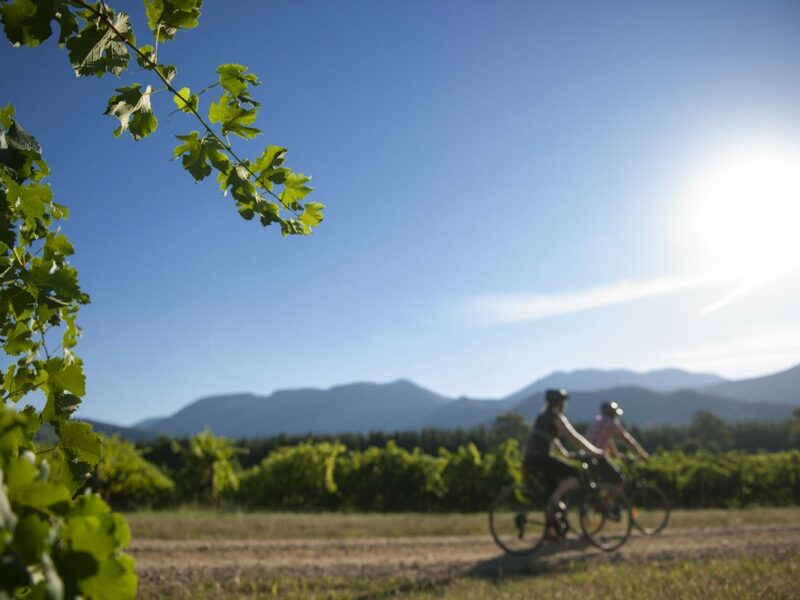 You’ll meet local producers of wine, olives, cheese and more between Beechworth to Milawa on the gorgeous Murray to Mountains Rail Trail. – Starting and ending in Beechworth, lunch is at the Milawa Cheese Factory, with special tastings along the way. The riding is easy, with mainly off-road paths using the rail trail, covering 35km with plenty of stops. – Bikes (electric assist bikes are available for an extra $25).